The “cheese grater” façade on First Avenue has been up since the 1960s. I don’t remember who first came up with the description of the aluminum front that hides the handsome architecture of No. 415 on Albany’s First Avenue West. But now, the days of the “cheese grater” may finally come to an end. On Wednesday (July 18), the advisory board of the Central Albany Revitalization Area will consider a $10,000 grant request to help pay for restoring the original storefront, which includes taking down the metal front and repairing the plaster on the brick walls. Ten years ago CARA had approved a $357,000 aid package to help upgrade what was known as the former Book Bin. 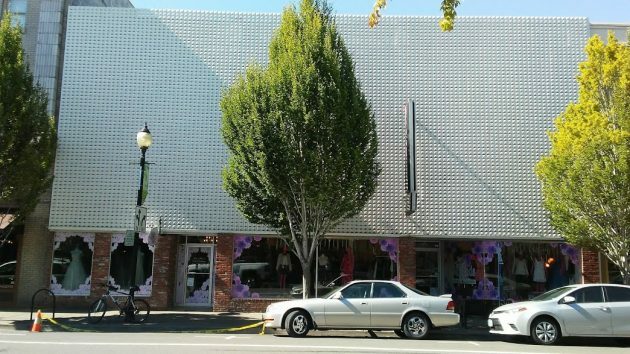 The applicant was Willamette Development Services, the Albany real estate investment venture that was then about to collapse. WDS did not follow through on the First Avenue project, and CARA canceled its aid offer in March 2008. The building dates from 1866. It is owned by Kevin and Sally LaCoste of Gearhart and leased to Mercy House International, an Albany nonprofit that operates 1st Hand Seconds Unique Boutique on the ground floor. The store’s proceeds support the organization’s program to help women get away from abusive men. Mercy House intends to buy the building and, as a first step, wants to restore the storefront at a cost estimated at around $320,000. The $10,000 sought from CARA would go toward restoring the second-floor arched windows, which will cost about $62,000. According to the grant application, once the organization owns the building it plans to restore the vacant second floor as an event space or as market-rate apartments. The second floor is reputed to have housed a speakeasy during Prohibition. Later it served as a meeting room for veterans’ groups. The aluminum cheese grater front was added in the early 1960s when the ground floor housed an appliance store. The view from across First Avenue West. 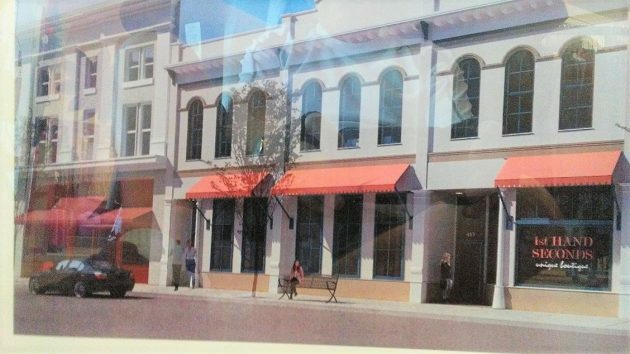 What the restored storefront would look like, in a rendering by Varitone Architecture. Another CARA waste of money! Perhaps CARA could re-open the upstairs Speakeasy, selling liquor to recoup dollars spent removing the cheese grater facade. If the CARA saloon proves itself feasible, Albany could lead the way with imaginative URD finance and some of CARA’s critics could be hushed. Our City Moms and Pops could barkeep/wait-tables/dishwash from time to time to keep their finger on Albany’s pulse. I’m not sure that 10 K will make a dent in the restoration, if they don’t have the resources to do the whole job they should leave up the great grate. Why are you not email blasting us all your pathetic little thoughts with those court awarded email addies????? Kind of a “Catch 22” situation. Sacrificing one form of period architecture for another. My wife and I lived in Painesville Ohio for a period of time and saw this dilemma in several cities around the Cleveland area. Albany is fortunate in the respect Downtown Albany is a small area with much potential. Returning the charm of the early era of Albany is a wonderful idea. My vote, lose the cheese grater. Bring back some of the paddle wheelers. We are not utilizing this part of Albany’s past. The cheese grater is historic according to the Historic Preservation League of Oregon. It is at least 50 years old, retains physical integrity, and demonstrates historic significance. The league is all about preserving character-defining features and the cheese grater is definitely character-defining. It defines downtown and fosters community pride. The cheese grater makes Albany, Albany. To paraphrase the league….Albany can’t build its way to sustainability – it has to conserve its way. 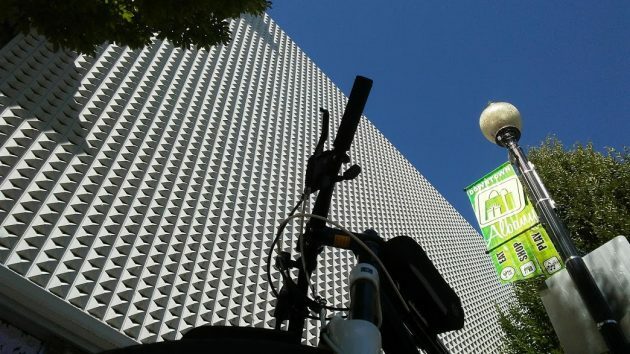 The Cheese Grater is outside the period of significance for the downtown historic district. It will be great to see this building restored. In the 8th year of Mercy House no one has the understanding of the impact that this ministry has done to save thousands of abused women amd children stuck in abusive situations that without Mercy House literally could not be here tomorrow. There is so much more to this happening that is not understood. Mercy House gives back to the community in a way unimaginable. The building is literally crumbling daily under their feet. They are not looking specifically to CARA, they are an amazing group of hard working men and women determined to purchase this building to make even a greater impact in our community! As the building crumbles under their feet they will be forced to leave. The entire project from purchasing the building to future plans can be seen at the boutique. Help from CARA would be great, as of right now the $10,000 is only a drop in the bucket. But to restore and fix the true historic building like the rest of the downtown, that “cheese grater” monstrosity must rest in piece at Burchems Metals! I for one, 1, am not a fan of walls! Remove it while we are removing N. A. trees for the sake of zero lot line homes. Tear down the wall ! Have to ask though… is that a GHOST in the Varitone rendering image? Boo! Tear down the WALL so we can see what is there.